Well, dang. Regular readers know that every once in a while my brain goes on strike. I can't imagine how I used to preach week after week after week. Usually, I do a re-run or fill with some video. But after posting something every week since April 2009, the time has come to take an intentional break, a sabbatical. Meanwhile, I have some suggestions to broaden your blog-reading horizons. Most are not about mental health issues. They are the random reading that feed my mind and soul, a selection from my blog role. Consider this my annual Summer Reading post. First up, of course, Knowledge is Necessity. John McManamy gave me a leg up in the blogging business, when he introduced me to his readers, as the only other blogger he knows who writes about the anterior cingulate cortex. I think of us as blogmates. Knowledge is Necessity is as close as you will get to your weekly Prozac Monologues fix. The way John puts it, from God to neurons. Not that you could mistake one of us for the other in a crowd. For one, he's a lousy dancer. Kinda scary, actually. But his writing -- you'll snort milk out of your nose. 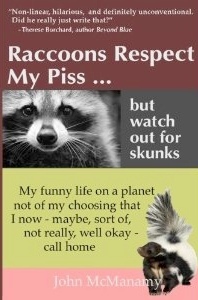 Here is my review of his new book Raccoons Respect My Piss, as well. I am reading it a second time right now. Second, Untangled by Dr. Kelly Flanagan. Notwithstanding the fact that I write a mental health blog, I don't actually read many, especially not the inspirational ones. I don't respond well to people who give me advice, even good advice. Especially good advice. Just ask my therapist. But Flanagan can tell a story. He respects the knots we tie ourselves into in a way that helps us untangle them and find a bit of freedom. Flanagan is relatively new to the blogging biz, and rather brave, I think, a psychotherapist who blogs about psychotherapy, exposing himself to his readers' triggers. He has managed it well when he trips mine. Responsive, but non-reactive -- I think that's what they call it in that language of theirs. Me, I have to choose between reactive or silent. So I admire how Flanagan can pull off that responsive but not-reactive thing and still tell a good story. So that's it for the mental health blogs. Cake Wrecks. When I need a dose of something nuts to keep from going nuts, I look at the weird things that people do with cake and frosting. The subtitle is When Professional Cakes Go Horribly, Hilariously Wrong. This blog is a whole franchise by now, with books, tours and contests. The photo above is of my own cake which I did not submit for consideration, because I am not a professional. At the cake-biz, that is. But it gives you an idea of what you might find at Cake Wrecks. 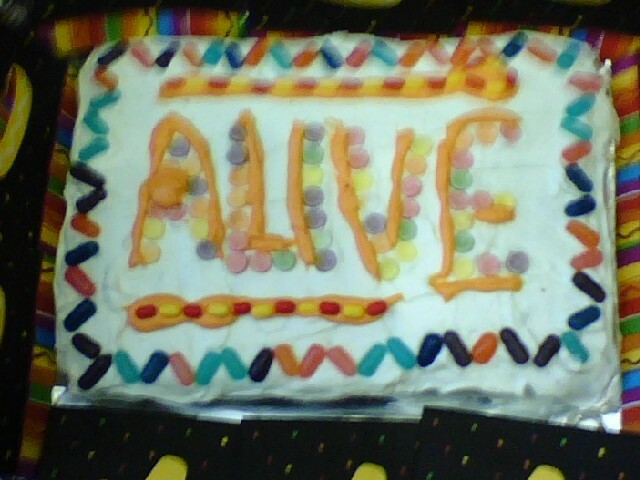 I made this one for a guerrilla party held in the lobby of a hospital where I would commit suicide rather than be hospitalized, to celebrate suicide prevention. My arts and crafts piece here was handicapped by a dearth of materials. In a fit of good sense, I had turned over to my shrink my stash of old, ineffective or intolerable and dangerous meds. (I had quite a collection.) 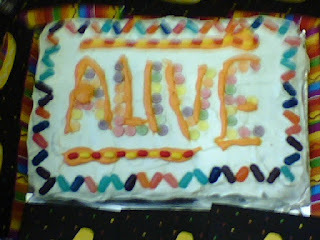 So I couldn't decorate the cake with pills, which had been my intent. I had to substitute Mike and Ike's and Smarties. Cake Wreck cakes go way beyond this effort. Which leads me to Suicide Food. Only this blog is not about suicide. Well, not that kind of suicide. It collects advertising images that depict animals acting as though they wish to be consumed. You know, like instead of the Chick-Fil-A cows, encouraging you to eat more chicken, these are the little piggies inviting you to the barbecue. There seem to be an inexhaustible supply of these scenes to which you may be completely oblivious (I was) until you read Suicide Food, where they are rated on a scale of one to five nooses for just how sick they really are. The folks who bring you Suicide Food are also on sabbatical. But they have five years' worth of shrimp lounging and waving to you from the cocktail glass for you to peruse. Finally, you can tell Shell Shock - Nell's Big Walk is not a mental health blog, because it has a beginning, a middle and an end. An end, what a concept. Here's the deal. 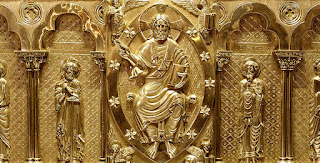 Helen and I have been thinking about the Camino, a 500 mile walk across northern Spain, from the Pyrenees to Santiago de Compostela, a pilgrim route over 1000 years old, to the place where are buried the bones purported to be of Saint James, the brother of Jesus, washed up on the shore of northwestern Spain in a boat made of stone. My kind of pilgrimage. In our consideration of this enterprise, we had been reading others' accounts, which are, for the most part, filled with angst and/or stupidity, slathered with pain and misery. I mean, I thought Paulo Coehlo's quest for his sword to be the most self-absorbed little boy obsession I have ever read. But we kept reading. Helen was researching boots when she came upon Nell Spillane, an Irish trainer and business coach. Nell and Frances, childhood friends, celebrated their 50th birthdays by fulfilling a vow to do the pilgrimage when they got old, which they took to mean 50. Nell's blog is a day by day account. Helen and I spent Lent this year, reading one post a day. Neither of us has had the heart to finish the last few days and be done with it. Obviously, we could use a business coach. I am stuck 20k short of Santiago. Frances and Nell had fun! There are spiritual moments. All the piety that means something to us means something to them, going to the pilgrim masses, putting beads on the wayside statues of Mary. 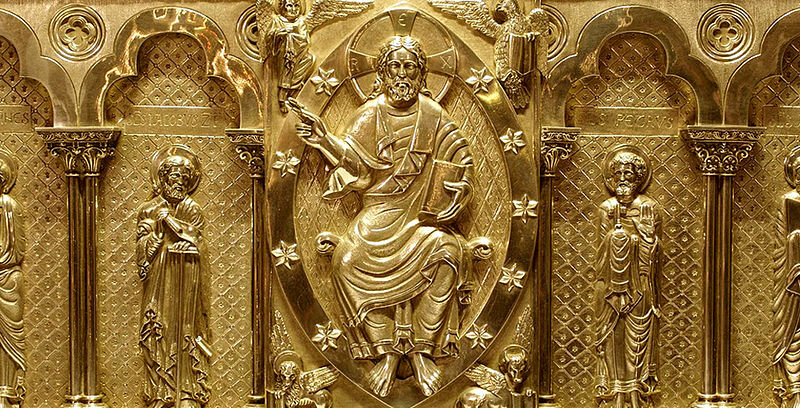 But it's the comfortable sort, the Celtic thing/Teresa of Avila/feel free to cuss God out/don't take yourself and your precious insights so seriously sort. Go ahead, eat that ham sandwich (after you dust it off). Just wash it down with some more wine. One thing has become clear. We will not begin our Camino at the most typical starting point, St. Jean Pied de Port on the French side of the Pyrenees. No, we will honor our Irish ancestors and begin where they would have, outside the Guinness Brewery St. James Gate, Dublin. And thanks to all my readers. Drop in now and then this summer. You might find something new. But for anything that requires the frontal cortex, see you next fall. De nada Willa! You can get your pilgrim passport stamped both at the Guinness reception area (in that gate and just to the left) and also at St James church with is a minute down the road thus covering all bases! Let me know when you're heading out and I'll stand you both a pint of 'the black stuff' (Guinness).